Money laundering schemes account for between two and five percent of the world's gross domestic product, according to the IMF. Such schemes are used to fund terrorists, evade taxes, sell arms, or accumulate obscene amounts of wealth. They divert money from every honest person into the pockets of criminals. Money laundering techniques are complex by design to cover up their trail. It takes perseverance, imagination, and insight to unmask these activities; however, investigative journalist and financial expert Nick Kochan does just that. The Washing Machine takes readers deep inside the intricate world of money laundering. Kochan offers fascinating insight into, and explanation of, the murky world of illegal financial dealings over the past 30 years and the sometimes-heroic attempts to combat it. In the hands of the author, the launderers' sophistication becomes understandable and captivating, as the characters and stories woven into the explanations are brought vividly to life. The current effort to stop this sinister financial pipeline is one of the highest-profile law enforcement activities in the world. But is it a losing battle? 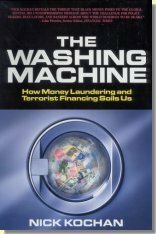 The Washing Machine reveals that globalization and a lack of cooperation among international law enforcement are playing directly into the hands of the criminals. This book is a wake-up call to curtail the flow of funds before the threat of economic destabilization becomes a reality.